I've been keeping an eye on this MMORPG for about a year now, and today I received my email to one of the first 500 BETA testers. I'm really ecstatic of it!! SEED is a very different kind of MMORPG, and this is besides the fact that it uses cell shading, which make for some awsome environments and screenies. Basically it's a roleplayer's dream MMO. So I'm quite excited to be among the first BETA testers and I cannot wait to login to the Tower for the very first time. And the great thing is that the NDA permits screenshots! So I'll post them as I explore this brand new world. In the mean time you can enjoy some here. I came across this fellows site yesterday and was impressed with the quantity, quality and funny signature he's listed. There's a lot of them and it'll take a while to all load. Worth the wait though. Check it out at "Brother Benthor - EVE - Design Page". And here's my new signature as part PPL, until I'm deemed worthy enough to be promoted to midshipman. I especially enjoy the toothbrushes! If I find my old Coreli signature, I'll add it here. This is funny as hell to anyone who's played or is currently playing RPGs!! Heck I remember guys like this! This fake documentary on RPG gamers is a must see: Fear of Girls - Google Video. The guys who made it are right on the money. 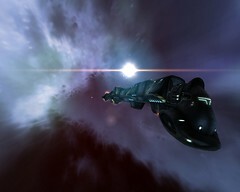 Heading out towards Hokara in my Vexor. 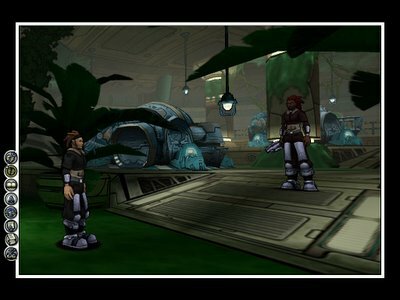 Last night, after closing up Combined Mercantile Holdings and emptying its hangars and accounts, I packed a few belongings and headed to Horaka to report for duty. This was the longest voyage I had ever taken; a total of 46 jumps. After leaving Vlillirier I headed to Covryn where the majority of my assets were. There, I resigned as CEO of CMHI, after emptiyng the corporate hangars. I then switched to my faithful Vexor, slapped on a combat set up, packed my mining gear and headed back out. My next stop was Aulbres, where I picked up a Mining Barge skill and a few other trinkets. Then I was off to a 30 jumps itinerary in order to get to Horaka. After about 20 jumps, I got to Du Annes, which was as far as I had ever been (in that region). All that lay before my eyes was new territory to me. Upon my arrival in Horaka, I headed to our offices, docked and reported for duty. Now, I've left most of my gear, ships and other assets back in and around Covryn, so sooner or later I'm bound to go back. But for now, I'm happy exploring new systems and doing my job as a member of Phoenix Propulsion Laboratories. "Cadet Treenara Mazouk, reporting for duty sir!" As you know, I recently left Coreli Core and started Combined Mercantile Holdings while I expanded my trading network, skills and abilities. But EVE is a very social beast and is made to enjoy as such. So while I was having fun trading in industrial goods - and making very impressive profit I might add, I was still looking to join a well established corporation. About a week ago, my long search ended. While reading E:ON #2, I cam across an add from Phoenix Propulsion Labs Corporation and after going through their website from top to bottom, I knew this was the one. So after meeting some of its members over on their public channel, SHOP@PPL, I decide to apply and completed an application. The next day I received an email requesting my presence for an interview. After agreeing upon a time, I prepared myself by learning as much as I could about PPL. Earlier today, I completed a 2 and a half hours interview with the head of HR, Gilgamoth. Let me tell you that this was one of the most professional and complete interview I have ever done, virtual and RL. After the interview I was convinced I wanted to be part of PPL, and sure enough, I was accepted. Head over to OGaming for an interesting interview with Reynir Harðarson Creative Director at CCP. Some great screenshots, tidbits on EON and other goodies. These last few nights I've been running back and forth between Vlillirier and Vivanier, moving full cargos of Construction Blocks. The systems are 5 jumps apart, and though that's not much, doing it with "Big Fat Mimi", my trusty Iteron Mark V, takes a hell of a lot longer. Thank god for 10mn Afterburner II. This shot was taken in between the 2 systems, though I can't remember which exactly. Makes for a great desktop bakground. Last week, MMORPG.com released the results of its Reader's Choice Awards in which EVE Online and CCP won 4 awards. Though I voted for EVE Online for all these categories, I'm happily surprised it did that well overall. This shows the quality of the game and the dedication of the EVE Community. Seriously folks, we're that great, I'm telling you! Talk about a great way to start the week! This morning I got an email from Martin Ellis from EVENews.com telling me I had won the 1st prize in their first ever competition. I'm the lucky winner of the 2nd issue of E:ON #2, and an autographed CD of the EVE soundtrack. I had planned to eventually get the soundtrack, but getting a signed copy is one hell of a prize. I'm really excited about it and can't wait to get it. Depending on when it's shipped, I might get it by next week - since it's coming from the UK. 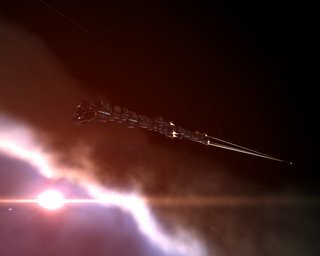 Carriers, Titans and Motherships, what's the fuss? The EVE Skill System; What the? I really encourage you to bookmark it or blinklist it, and read it on a daily basis, cause it has the finger on most major scoops. As for the soundtrack, well I'll have to let you know when I get it. 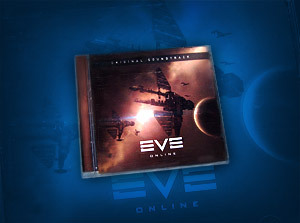 Having downloaded all available tracks from the EVE Download Music section, I should not be disappointed, though my favorite track "Opinions of the Misinformed" isn't on the soundtrack. But an autographed copy is a collectors prize. It makes it that much special. 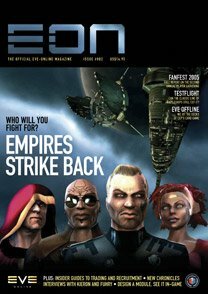 Thanks again to EVENews.com for their contest, for the prizes, but mostly for their hard work in providing the EVE Online community with such a great resource. 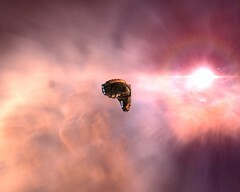 Last Sunday EVE Online came closer to reaching the astonishing mark of 25,000 players logged in at the same time. One universe, no sharding nor instancing. Now this is not impressive I hear you say because other MMORPGs have much more players logged-in at the same time. But are they in the same gaming universe, or realm? The answer to that is a resounding no. And that's because other MMOs in order to balance server load, split users amongst various servers, or realms as they are often called. This creates a multitude of worlds where can only interact with the other players on that same server. World of Warcraft has over 100 of theses realms if I'm correct. 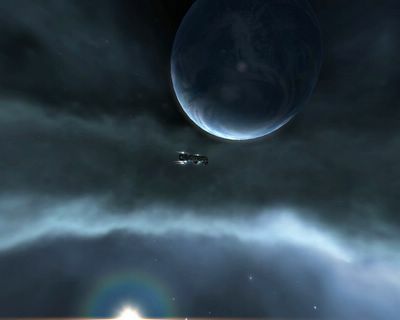 EVE has always maintained the approach that an MMORPG offers a better experience if players can all interact together. Anyways, enough boasting! This milestone got me thinking about EVE's PCU (Peak Concurrent Users) records of the last few years since it came live. So I did a bit of research and using mainly MMORPG.com, EVE Online's news and a bit of googling I gathered as much data on the past PCU records. The above chart represents the progress of the PCU over the last 2 years. Notice though that there is a gap between September 2004 and August 2005, as I was not able to get any data on those months - that's almost a year missing. Still, this gives us a good indication of EVE's progress. If this trend continues, we should hit that 25k mark sometime in late March, early April. Let's see if we can do it sooner! Congratulation to CCP for a job well done. These results prove it without a doubt. Lately, 'gold farming' companies such as IGE and Power Leveling -— companies whose business is the accumulation and (potentially illicit) real-world sale of virtual MMO property, including gold, in-game items, and characters -— have begun running ads in magazines like ours. For the record, PC Gamer's official stance on these types of companies is that they are despicable: not only do they brazenly break many MMOs' End-User License Agreements, but they all-too-often ruin legitimate players'’ fun. For my part, I sincerely apologize to all of our readers for not being able to make this happen sooner. Unfortunately, 'the separation of church and state' that exists between PC Gamer's ad sales team and editorial team make negotiations like this one tricky. But we'’re all on the same page now. Good thing, too, because for a while there I felt like I was a big green dude in purple pants, bearing the weight of an entire mountain on my shoulders. As I had mentioned in a previous post almost a year ago, gold farming is an evil that we must rid MMOs of. Gold farming is a parasitic behaviour in which individuals or companies knowingly disregard the spirit of the games in which they operate and have a negative impact on game play. They disrupt the virtual economy put in place by the developers and operated by the players. Case in point: what if you were playing Monopoly and a friend came in the game after it had started with a whack of Monopoly money. Would you and the other players allow him to bring this additional money on the pretext that he had bought it from a friend of his? How would that affect the game you were playing? I'm pretty sure you wouldn't allow it. Or how about if you were sitting at a poker or black jack table and someone sat down and played with his own deck of cards? Would you allow him? Would the House allow him? Well it's the same in MMO. It ruins the game in the same manner, and should not and IS NOT allowed, with good reason. Blog Search - "PC Gamer Gold Farming"
Now PC Gamer's initiative may not have a huge impact by itself, but it's a step in the right direction. Hopefully others will follow. As such, as a symbolic gesture more than anything else, I've removed all such sites from my Adsense profile. It's not much, but it's my small contribution. Here's to you TheVede! Thanks for taking that first step. So as of last week, Coreli as I knew it was no longer going to exist. What was I to do? Where was I going to go? Going to Curse and following the "evil" Coreli into Curse was out of the question. Yet, moving to the new Gallente Venture, formed by law abiding ex-Coreli members, didn't seem to be the right path either. After the initial shock of the Coreli break-up, I sat down and looked at all my options. Coreli employees were already venturing to new and unexplored paths. I had to make a choice. Back in the days before Coreli, I had been part of a very small corporation, Sorbion. It was a loose mix of employees, held together by some unknown goals. Suffice to say the experiment did not last long. But before being dismantled, I had a chance to head Sorbion as it's CEO. And even after joinning Coreli, I knew that one day, I wanted Treenara to be the head of a successful corporation. Since I had taken up trading recently, I decided that if I was going to start up a new corporation, its main focus would be trading. I still had that Dominix BPC (Blue Print Copy), and I also wanted to build that ship. Last Thursday, I created the Combined Mercantile Holdings Incorporated (CMHI) in Stacmon, with corporate hangars in the next system, Covryn. From there I do runs between Iges and Intaki, buying various trade commodities. By buying low and selling high, I'm able to make about 3 to 4 million ISKs an hour. Not bad. My short term goals are to ramp up CMHI's bank accounts, then build that Dominix. After that, there are a few expensive trading skills I'll be looking to buy in order to perform large profitable trades from the comfort of my head quarters, all the while building a corporate empire. 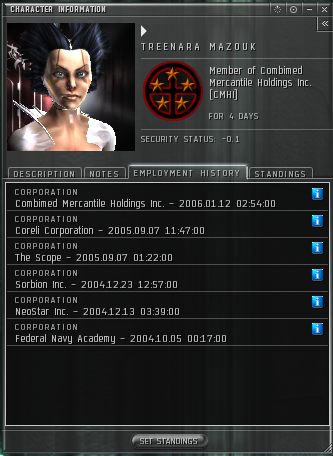 About a week ago I was quite surprised to learn that my EVE corporation, Coreli Corp, was splitting up. It seems that most directors wanted a change, and after some posting on our corp forums, it was decided that Coreli would split up into two: one would embraced its roots in smuggling and the others would stay faithful to its new goals, defending the Gallente Federation. I must say, I never saw it coming at all, and was completely stunned. My experience in Coreli so far had been very good. It was one of the most engaged corp I had been part of, and its members were a dedicated bunch. As an RP corporation I was having a lot of fun keeping up with the various events we were involved in. Recently, I had discussed with our Director of Production, about a position as a Director of Production for the Placid region, and was really excited about it. I had trained my Production Efficiency skill to level 4, and was completing my level 5 (a 14 days skill mind you) when I learned the terrible news. My dreams of overseeing the region of Placid had just gone up in smoke. Though the split occurred somewhat smoothly within the corporation, outside it was a bit chaotic. You see, Coreli had recently founded an Alliance (a group of corporations in EVE) with the goal of defending the interests of the Gallente Federation - "Fighting for a Stronger Federation" was our motto. But things were doomed from the get go. From the beginning, the Cyrene Initiative, as it was known (and still is) was not going to work properly. Within a week the in-game chat for the alliance was dead quiet. Nothing significant ever occurred out of it. Some blame its founding members, some blame the lack of interests from the corporations themselves. Suffice to say, it did not last very long. Now right about the time the Coreli's directors decided on the split, Coreli was contacted by an opposing corporation, and to make a long story short, things turned ugly between the two. When the split was publicly announced and Coreli split from Cyrene, a war was declared against the alliance. You can read about it in this post, on the EVE-Online OOC forum. Things have quieted down now, and people have started going there separate ways. The evil Coreli is moving its assets and personnel into Curse region, the loyal federalist have founded Gallente Ventures and continuing the path that had been until recently followed. But a lot of members have gone there separate ways, each taking this chance to explore new avenues. Some friends will be missed. Good luck to you all, Jenna, Freeda, Zofo, Luance, Joshua... it was fun! This is my first post using the Performancing extension for Firefox (PFF). I still have some doubts, but we'll have to see if it's really usefull to me. More to come on that later.